A new store concept for the parent brand, Pottery Barn Dorm that focused on Teenagers going to college. A few of the shopping bag concepts are shown below - the winning concept was the "doodle" bag. This design with a graph paper base and note taking type doodles was interjected into the rest of the collateral. Long tubes to hold decals, hang tags, rigid boxes for merchandise all had a play on the doodle concept. 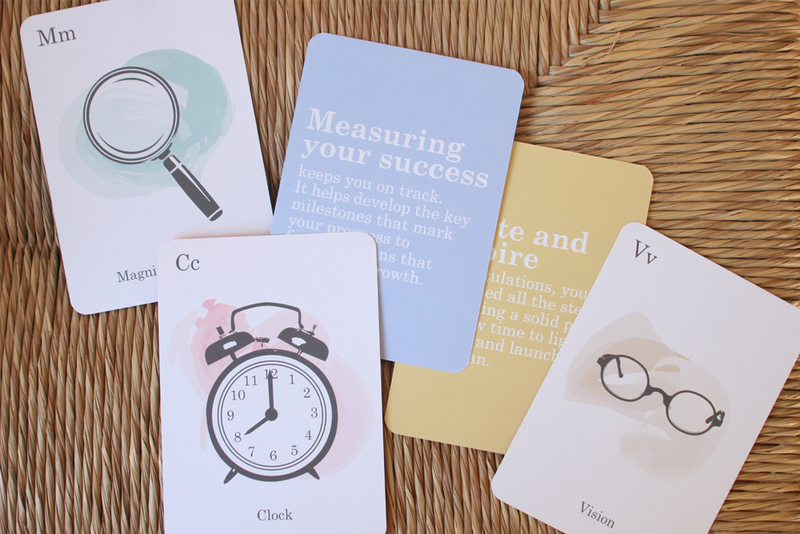 I created this clever take on the typical boring corporate collateral to be fun, entertaining and cute enough to leave on your desk. These cards made there way onto billboards and behind magnets - not in the trash. A catalog of the merchandiser's findings from a Trend Report trip to Paris & London. These booklets were shared internally and used a quick reference guide as well as inspiration. 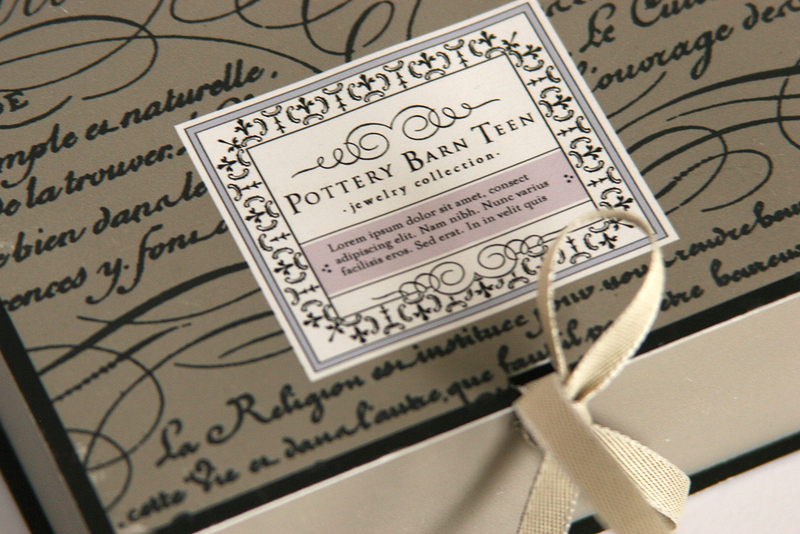 Giftable packaging is table stakes at Pottery Barn. These adorable duster bags held a variety of giftable items, ready to be put straight under the tree. 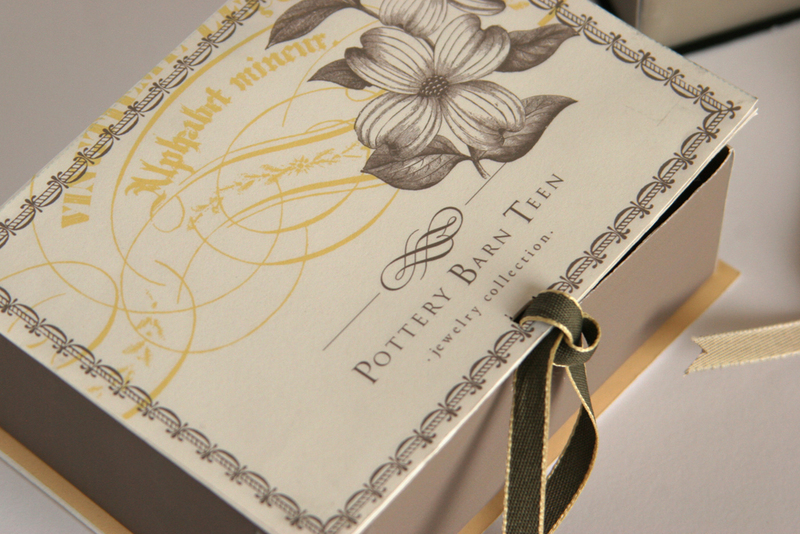 The hand-etched quality of the type gave the packaging a handmade feel. The DIY rage was about to begin! For the launch of PB Teen's jewelry collection I presented a few comps of gift box ideas, each one playing with calligraphy and delicate details. We wanted to surprise and delight the customer with these elaborate designs. Given my background in stationery it was only fitting that I would lead the launch of Pottery Barn's stationery line. A careful curated sort of cards was available at the checkout. Buying a gift? 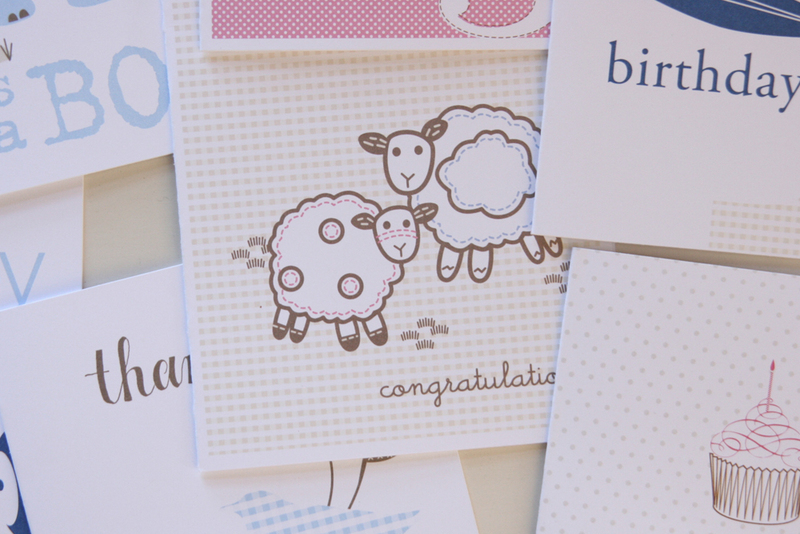 Don't forget your adorable card to go with it. And with stationery comes gift wrap for boys and girls. This brochure was sent to stores to help customers choose their appropriate gift wrap options.